Today, because of the upcoming trip that I will be embarking on, I wanted to discuss air travel with diabetes and the supplies. Traveling by air with diabetes is not a fun venture. Diabetics have a lot of sharp, pointy objects that they travel with, additionally they have a lot of liquids that they travel with. 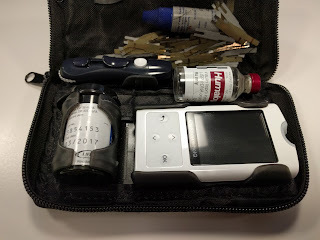 On a short trip, I travel with a minimum of 1 infusion set per day (you never know what could happen) and 1 bottle of insulin for every 3 days of trip. I use about 250-300 units of insulin per day. For a 6-day trip, I'm bringing quite a bit of supplies in order to keep myself safe in the face of any issue that might come up. On top of the insulin pump supplies, I carry a canister of 50 test strips per week gone (and usually that's just the extra set as I have a canister in my case with the "active" bottle of insulin that I currently have. In my glucose meter pouch, I also have a needle in order to fill a reservoir and extra lancets, but they're not visible in the picture. Why is all of this important? Because when it comes to traveling, I think I've proven that I know what I'm doing with respect to my body. I know that my insulin pump is not able to go through the belt scanner (like with my bag) or through the full body scanner. TSA guidelines tell me that I can elect to not go through either of those two methods if I wish, but will receive a personal pat down from a TSA agent. That's fine, but I just wish that I could elect for that, and not have to give an explanation why, or deal with a TSA agent telling me that, "Oh, I'm sure you can just go through the scanner, my friend is diabetic and he can go through it." I'm sure that these TSA agents are experts on the matter, but I don't trust them with my life anymore than any other person going through airport security REALLY trusts them with their life.